Yesterday, I forced myself on New Horizons -- scheduling, paying and taking the Microsoft Office Specialist (MOS) 77-888 Excel 2010 Expert exam in one day. Despite some very disturbing technical glitches that had me wasting about 20 minutes out of the allowable 50 minutes total time on 4 out of 29 questions, and required the test admin to hard reboot the computer, I still managed to attempt all the questions and passed with a 800/1000 score. 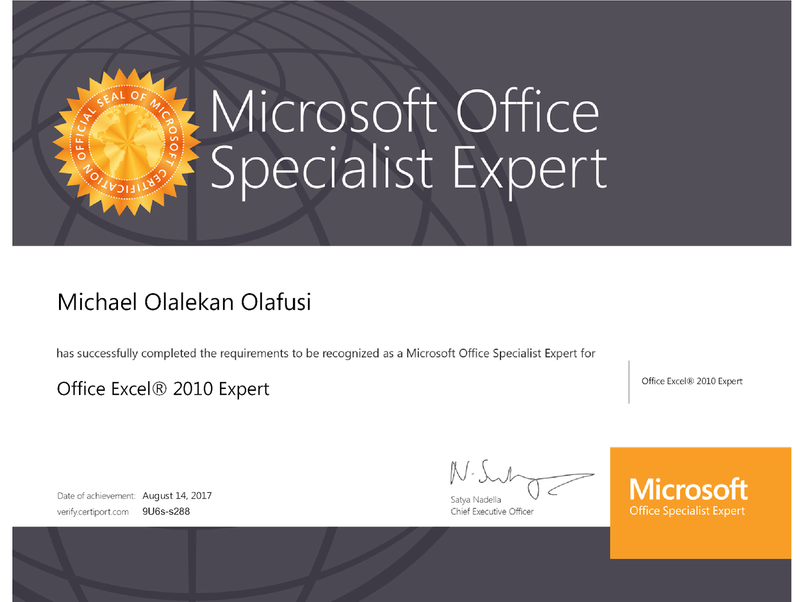 I have now fulfilled the certification requirement to kickstart the process of becoming a Microsoft Certified Trainer (MCT). The other two steps for me are to get an evidence of my instructional skills (either via a qualifying Train-The-Trainer type of certificate or a reference from a Microsoft Learning Partner) and another acceptable reference from my workplace/contractors. I currently have trouble with the evidence of instructional skills. Though I have been delivering 2 to 8 training sessions monthly for the last three years, they just won't accept my word of mouth evidence. Then the Microsoft learning partner I reached out to, New Horizons, are at a lost about the whole MCT process and seem unwilling to make my problem theirs. Then the acceptable Train-The-Trainer certifications are not available here in Nigeria (as far as I know/checked). Luckily, I will be presenting later this year in the MCT Africa Summit and two of the main organizers are MCTs. I reached out to one of them and he too was at a loss regarding how I should get past that stage. He got his 10 years ago and followed a slightly different path. The only sure option he provided was to attend the Microsoft backed Train-The-Trainer session that will happen before the MCT Africa Summit, in December. It's a little pricey and four months away. The other guy had to travel to the US to get his (or got his when he traveled to the US). In a wild shot, I emailed one of the Microsoft Learning team lead explaining my situation and asking for his expert advice. I hope he replies, and favourably. It's really worrying that so many things other people in other countries have easy access to are either unavailable to us or very difficult to access in Nigeria. There are many things I see other people generate full-time income from in other countries, when I try them I get to battle all sorts of restrictions and in the end lose the battle. It happened to my Udemy online course, when Paypal showed me hell and seized my money twice or thrice, I gave up and made the high ranking course, that took me months of hard work to put together, free. And now I see it happening to my Amazon published books. The payment company I used to receive my book sales royalties sent me an email last month that they no longer process payment from Amazon for one of the book sales. Now I understand why so many youths get frustrated in Nigeria and seem to look lazy/uncreative compared to other youths in other countries. How did you manage to finally get it ? I have read a recent post (I am writing exactly as of the 24th of march 2018) where you announced that you have obtained the MCT designation. I am a Cameroonian and I am willing to provide training to students and young professional in Excel when I will be back in my homecountry (I am currently living in France and I will be back in 2 months from now.) Any advice will be deeply appreciated.